The Garden Terrace bar at the Waldorf Astoria was opened last week for the summer. The bar serves not only the hotel guests, it is open to the public with a rich menu of fancy cocktails and tapas. 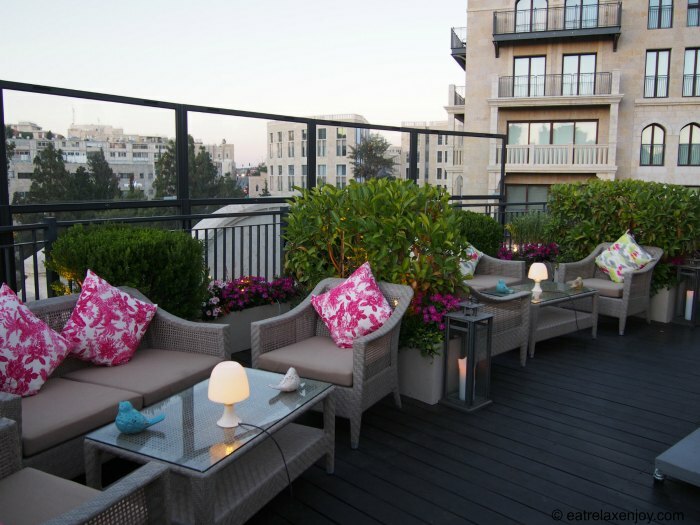 The Garden Terrace is located on the rooftop of the Waldorf Astoria on the 4th floor. It is lovely setting in the fresh air with cool breeze in the Jerusalem atmosphere. The bar is place to rest and relax, have a drink and snack some good chef-made tapas. The setting is informal with rattan sofas and armchairs between bushes, flowers and herbs. 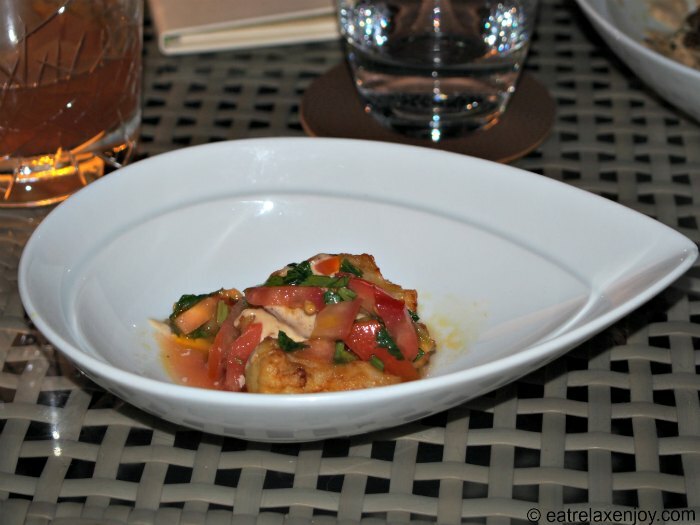 We spent a lovely evening at the Garden Terrace tasting tapas and cocktails. I really enjoyed sitting in the breeze before it got dark, and when it did, it turned romantic. While it got darker it was quite cool and the staff gave me a shawl. The food at the bar is tapas style. A large variety of small tapas, from the garden, the sea and the farm, all kosher and are made of fresh ingredients. The menu by Chef Itzik Mizrahi Barak is inspired by the theme “50 years to the unified Jerusalem” and contains Jerusalem authentic dishes such as Jaffa Gate Cauliflower, Jerusalem Mix and a signature cocktail “Jerusalem of Gold”. We were guests of the bar and tried a large number of tapas. The tapas are priced at 40-50-60 NIS. Jaffa Gate Tempura Battered Cauliflower sitting in Tahini and tomato salsa - a small vegan plate of a number of fried cauliflower drums in yummy sauce. 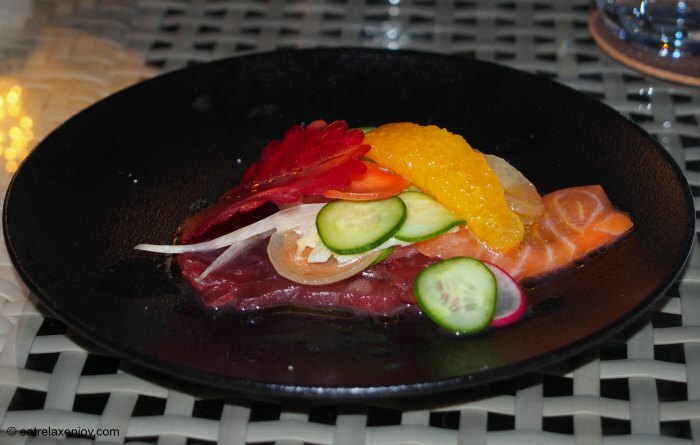 Red Tuna and Salmon Sashimi with garnish – the tastes to the fresh quality fish are emphasized with only a hint of garnish and seasoning that does not take over the flavors. 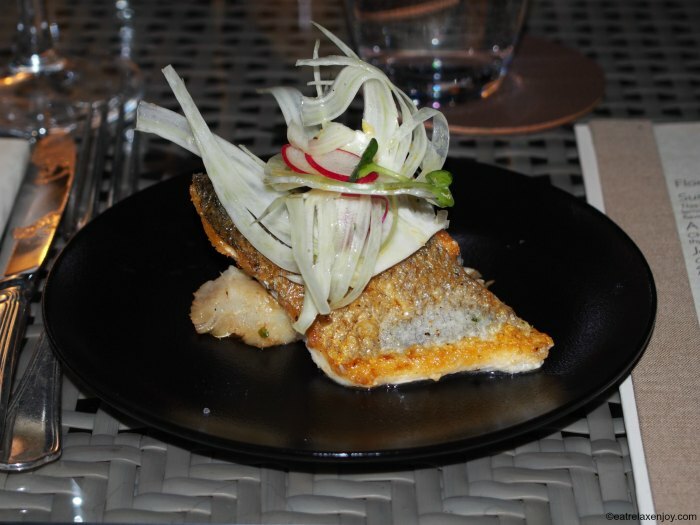 Bass a la Plancha, served with roasted artichokes & Spinach - very crusty scorched fish with melting artichokes – I loved it! Jerusalem Mix with root vegetable cream, onion, cilantro and roasted hot peppers –local-style dish, generously seasoned and spicy. 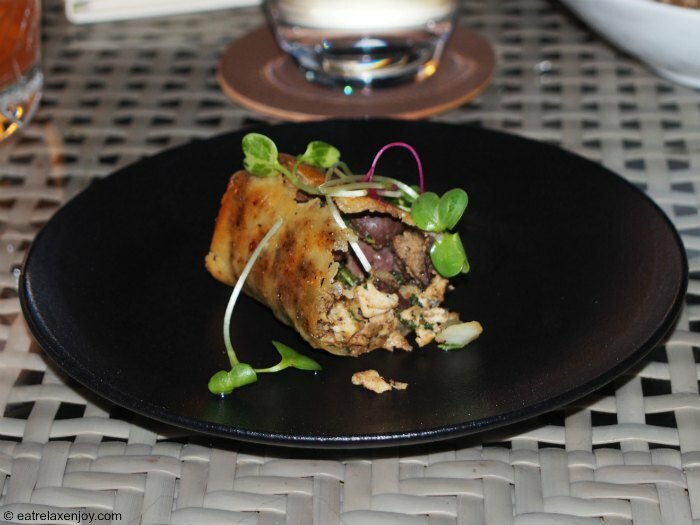 Phyllo dough stuffed with spleen and chicken breast – like the Jerusalem mix, it is meat made in local flavors served in brittle shell. 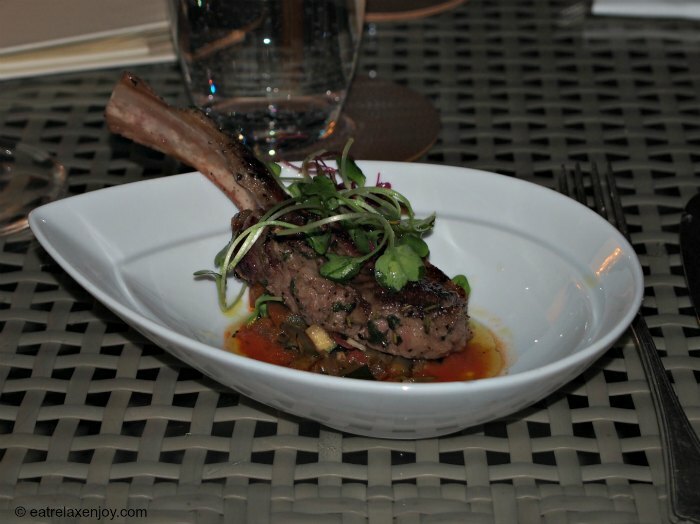 Lamb Chop on ratatouille, pepper cream and pesto – very well made lamb chop - soft and melts in the mouth, prepare to eat it with your hands! 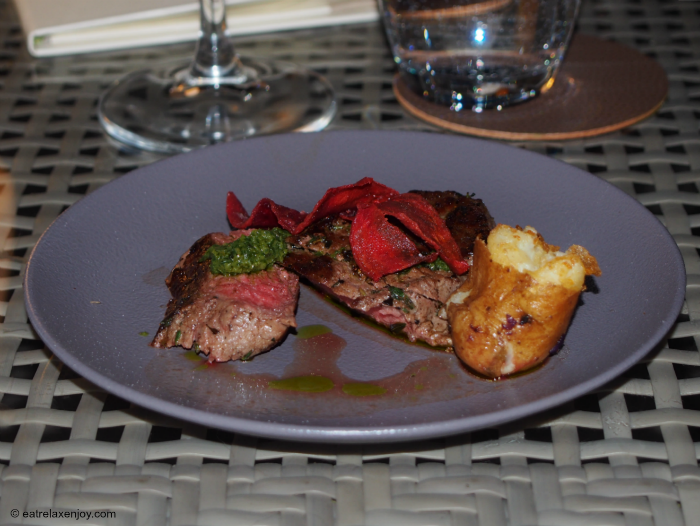 Rib-Eye Medallions a la Plancha with ratte potatoes and garlic confit – soft and tasty pieces of meat without the fat and connecting tissues! Excellent! 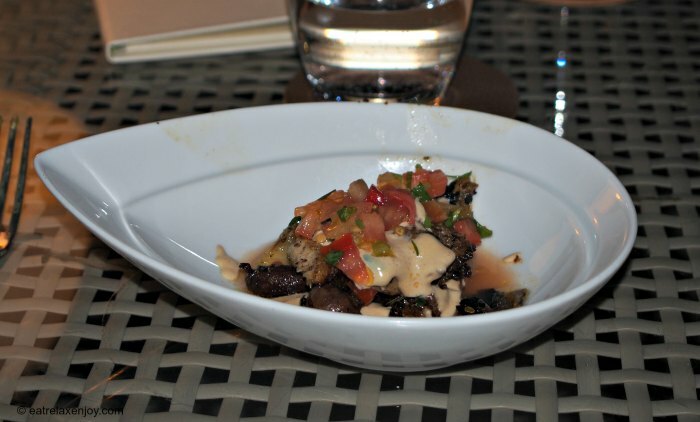 While served on a small plate, it is a rather generous quantity of meat compared to the other tapas. Perhaps the main reason for coming to the terrace is to drink. 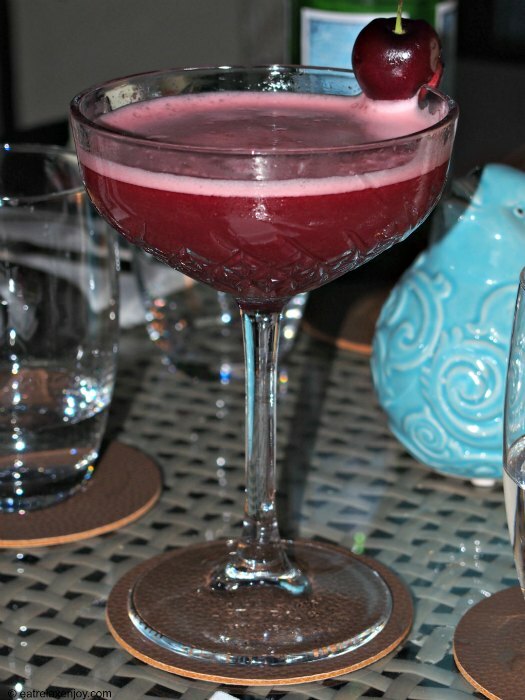 The terrace has a large variety of unique cocktails. We drank a number of them. 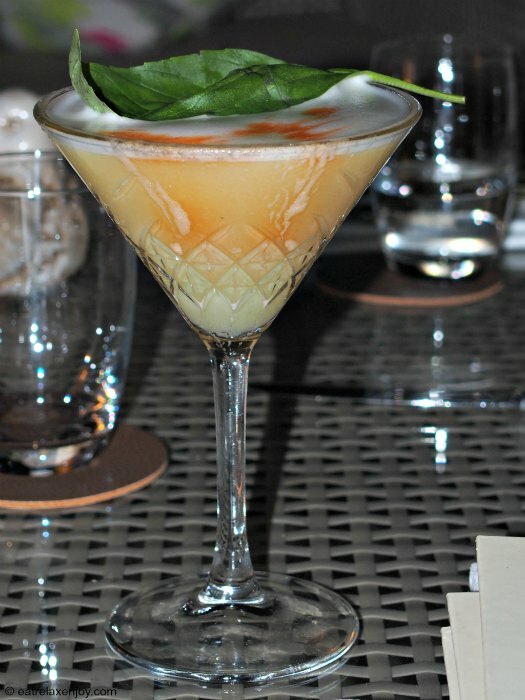 Jerusalem of Gold – this is the signature cocktail of the hotel! it contains Arak, Havana 7 and enhanced by cinnamon smoke. 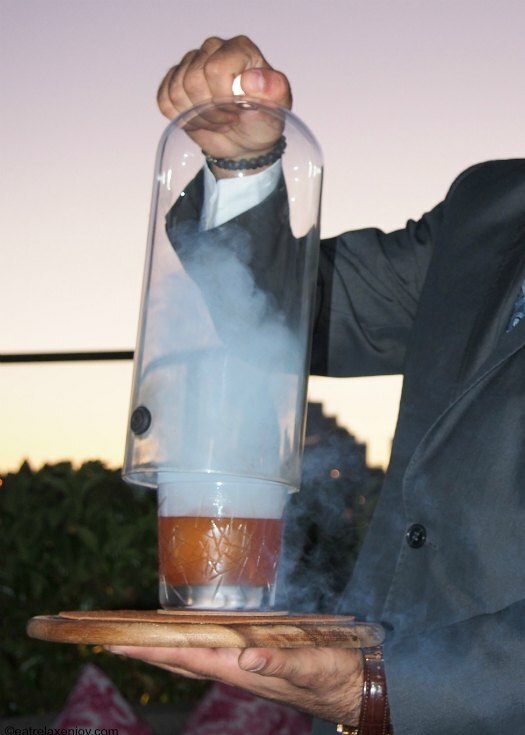 This cocktail is served in smoke. It is brought to the table inside a container full with smoke which is opened like a ceremony letting the smoke evaporate elegantly, leaving the cocktail scented with the smell of cinnamon smoke. Quite entertaining and unique! The cocktail has a unique smoked smell; if you sniff your fingers you’ll smell it long after you will finish the drink. If you’ll be surprised to see a huge ice cube inside, know that it is meant to keep the cocktail cold without diluting it (the ice-cube has a high volume but small surface area). Summer Breeze - contains Havana 7 and Beefeater Gin, peach and lemon notes and is covered by light egg white foam. The result is a silk sensation and a somewhat sweet cocktail. 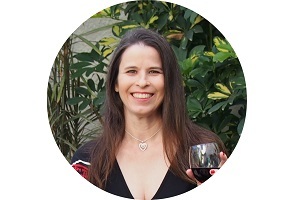 This was the most popular cocktail in my party, and my favorite! I promise you that you will want more of it! We also tasted Wild Rose and Basil Daiquiri that were very good as well. All the cocktails made of the best alcohol used in the most modern techniques. 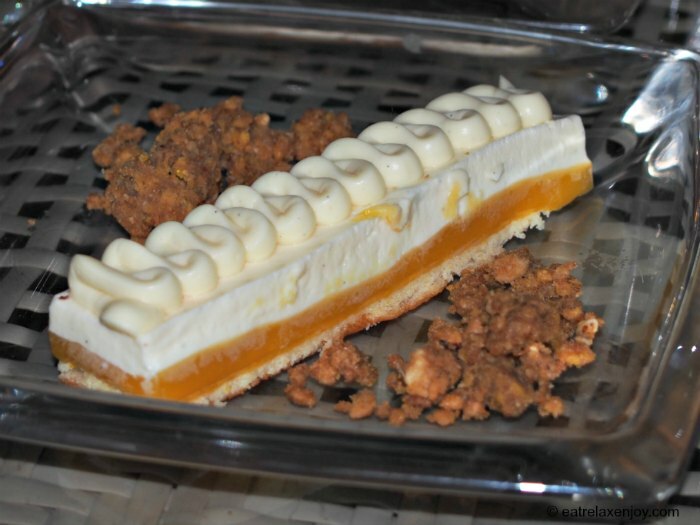 While the focus of the bar is not on desserts, it always serves a number of desserts, including a chocolate based one, and a ‘white’ dessert which may include fruits. There are also warm drinks – espresso and tea. 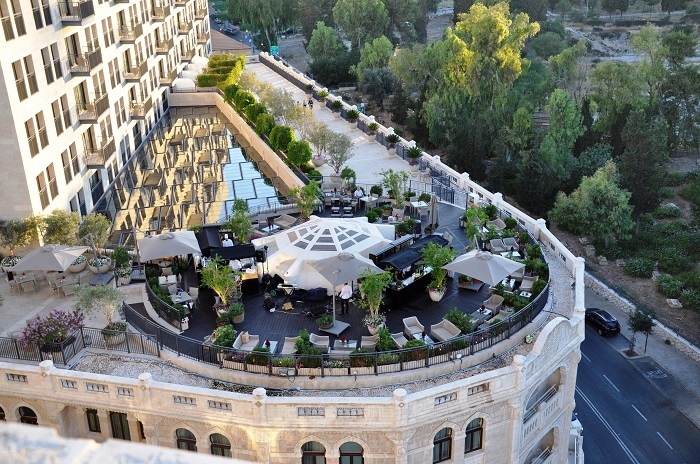 The Garden Terrace , Waldorf Astoria Jerusalem, open weekdays 18:30-midnight. Kosher. Prices: Cocktails 52-92 NIS, Tapas 40-60NIS. To read about the Waldorf Astoria: Waldorf Astoria Jerusalem - Luxury at its best (including a review of the amazing breakfast!